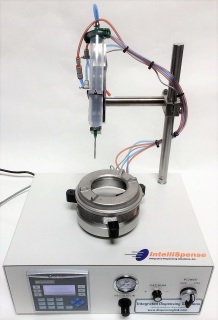 RotarySpense Flexible Rotary Dispense Systems are the perfect choice for laying down circles or arcs of any viscosity assembly fluid. Extremely popular for our customers in the speaker industry or for any circular form in place gasket requirements. This simple dispense system uses two stepper motors on the base to rotate two parts simultaneously as the dispense head above accurately applies a bead of fluid.The unit also includes a Z-Axis Slide, built in Pneumatic Controller for dispensing operations and the option to use syringes or any IDS valve. 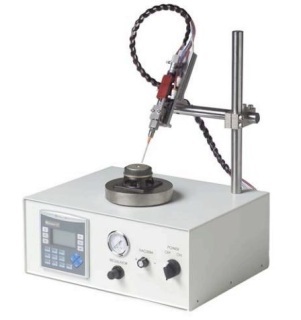 ​The standard model is a single table with pneumatic controller that can dispense from a syringe (usually 30cc or 55cc), or a single table with a Front Closing valve that can feed a valve from a 2 liter bulk reservoir. 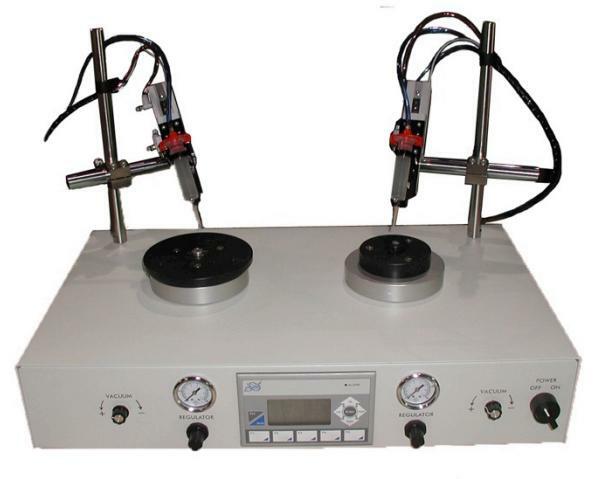 We can offer special builds with different valves, larger reservoirs, or even a dual table.